Disney-MGM Studios hasn’t had a true parade grace Hollywood Boulevard in a little while, but during the park’s first decade parades were absolutely a part of each and every afternoon. The interesting thing about first parades at Disney-MGM Studios was the fact that they didn’t highlight multiple feature films, instead they focus on a single film or property. From the television show Dinosaurs, to animated feature films like Hercules, Mulan, and Toy Story. 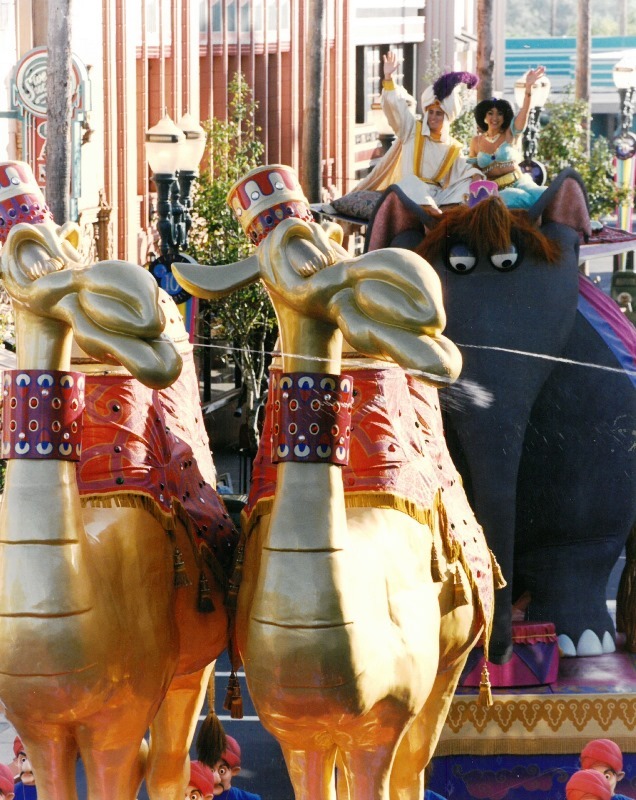 One parade that many of those early park-goers enjoyed and still remember fondly was the Aladdin’s Royal Caravan. Aladdin’s Royal Caravan premiered on December 21, 1992 all the way through August 27, 1995. A sibling parade in Disneyland held court between spring on 1993 until the summer of 1994, but Disney-MGM Studios kept the spirit of Prince Ali churning. While many characters, including Jafar, Jasmine, and Abu (in his elephant form), took part in the parade, the main theme behind the parade was the Prince Ali segment of the film. The caravan included multiple Genies, acrobats, a gorilla, a bed of nails practitioner, servants, and more jewels and gems than you could shake a flying carpet at. One of the highlights of the parade, however, was a pair of solid gold camels. Prince Ali may have had 75 golden camels, but these two are the one we really want to focus on. These camels’ heads would turn from side to side and occasionally spit on guests set-up along the parade route. I should point out that it was water, not actual spit, and that it was squirted on the guests, but I feel like most of that should go without saying. Does this pair of camels look familiar to you? They have actually had the most successful history coming out of Aladdin’s Royal Caravan. Once the parade took its curtain in 1995, that pair went on to adorn the entrance to Soundstage Restaurant. The Soundstage Restaurant resides where Disney Junior Live On Stage now takes place. When the park originally opening, it was given the theme of a wrap party for the film Big Business, but as the years went on it took on a prop warehouse vibe, featuring items from recent animated features. Perhaps that’s not where you’re thinking you know this pair of golden spitting camels from though? The closing of the Soundstage Restaurant was also not the end of the line for these two. The would move over to the Magic Kingdom beginning in May of 2001 as part of the signage for The Magic Carpets of Aladdin. While their ability to expectorate had been tamped down during their time as restaurant décor, back out in the open air of Adventureland they were allowed to let the spit fly again. Regardless of whether or not your first encounter was with the camels as part of the Disney-MGM Parade, ornamentation in the Soundstage Restaurant, or in their current home in Adventureland, it is safe to say that their spitting is part of their charm. In fact, on a hot summer day in Florida, I dare say it could be refreshing! Even if you don’t want to get wet yourself, it’s always fun watching children dart around the damp patch of pavement trying to get squirted, or trying to play chicken with the camels, and the giggling that ensues after a direct hit. It will be interesting to see if we find any of the props from Disney Quest, Ellen or The Great Movie Ride popping up elsewhere in WDW. It would be a shame to never see the Wicked Witch of the West again.